Browning Black Label Tactical Blades were designed with direct feedback from special operations, military, law enforcement and civilian knife experts. As a result, Browning has perfected a full spectrum of tactical blades that cover every mission imaginable. The Shock N’ Awe Tomahawk is made of 1055 steel with a powder coat finish and has a 2¾-inch blade and 10½-inch overall length. Other Black Label Tactical Blades include deep-cover neck knives, heavy-duty fixed-blade and folding utility knives, exotic push daggers and throwing knives. MSRP $80 (Shock N’ Awe Tomahawk pictured). The EdgeTek Fishing FlipStik offers an easy-carry sharpener with a 100% diamond-coated surface and oval contour for sharpening a wide variety of blade edges. 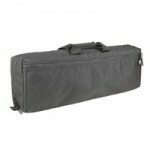 It is lightweight and compact, with a handle that also doubles as a carrying case. Those on the go who may need to touch up a knife blade or fishhook after lots of fieldwork don’t want to be caught without a FlipStik. MSRP $22. The Condor is a discreet takedown case designed to fit AR-15 carbine and similar-size weapons. The padded main compartment with removable padded divider allows you to carry your weapon with the upper and lower receivers separate and protected. The Condor features four tie-down straps to secure the weapon or components in place. The Condor also incorporates a large exterior zipper compartment with elastic loops for a magazine tool or other accessories. MSRP $139. The Tao pen design is an evolution and different from the other aggressive-looking pens and kubotans on the market. It does not look threatening, but is a useful, high-tech writing instrument with a stylish design. If the user is threatened or attacked, the Tao can be used at three levels of defensive force, depending on the type of threat. The Tao pen is made of 6061 aluminum, precision-machined and hard anodized. The heavy cap is threaded so that it will not pull off in use and castellated for greater impact. The flutes and grooves on the pen provide a secure grip. MSRP $70. Serving as a premium backpacking boot, the Crater Rim’s profile and construction mirror the immensely popular Danner OCH. With outsole and internal materials that reflect the needs of the rugged outdoorsman, this boot was specifically designed to tackle the most challenging terrain. The Vibram Bifida outsole delivers premium traction in the harshest environments, while a polyurethane footbed and Gore‐Tex lining ensure a comfortable and 100% waterproof yet breathable boot. The Ridgemaster is built upon the lightweight and stable Terra Force platform and features a cushioning polyurethane footbed with an additional layer of open-cell construction for air circulation. Underfoot stability is critical on any hunt, and the Terra Force platform provides the structure and comfort needed to be agile and stealthy in the field. Whether it’s big-game hunting, upland bird hunting or hunting in the Midwest, this boot is built to perform during any venture. MSRP $299.